When I found out that John Lewis had begun selling AllSaints online, I thought I'd delve into the collection and pick out a few things to add to my ever growing wish list (links at bottom of the page). They are the first department store to offer AllSaints on their website, which adds to their ever growing list of brands on offer. There's a number of brilliant pieces that'd look good in any guys wardrobe, but I thought I'd keep my list to a minimum and pick out the items that would offer versatility and form part of a 'capsule' wardrobe for this Spring. 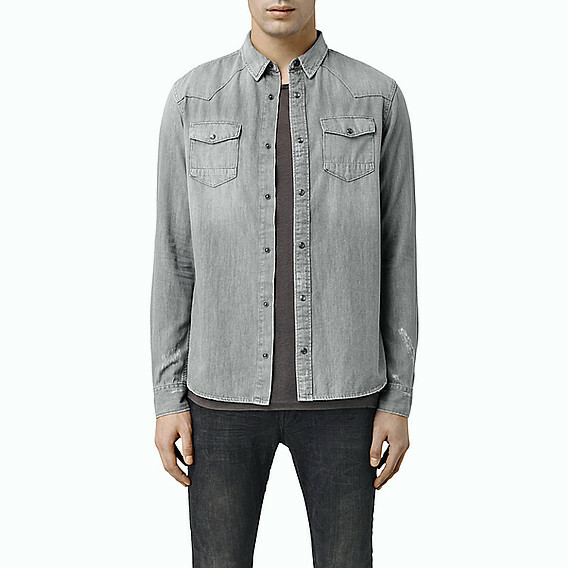 What I love about AllSaints, is the neutral and earthy tones they always use. It makes it easy to pair up outfits and never goes out of style. Of course, in my list I've picked a striped tee and leather jacket as these are two items I feel you should own and that AllSaints do amazingly. They set the level for leather jackets, and this one is perfection. I've also featured a few grey denim shirts/jackets as these are great alternatives for the regular blue wash and offer a more stylish and rugged look. The other items are perfect for layering and the jersey textures work brilliant in this transitional weather. They should also see you through to Autumn/Winter and are worth getting hold of and adding into your wardrobe. A number of the pieces come in alternative colours, so have a look at what else is on offer. The denim is a great fit and only gets better with wear and the slashed knee's are really on trend. Some people may feel that some of the items are above their budget, but they really are worth the price tag as AllSaints offers an amazing quality in their investment pieces. I went for items that are great staples and that can be mixed with what you currently own - but if you're anything like me, this charcoal, striped and denim collection is perfect for this time of year and is everything I could want in my wardrobe.